Ikar is a young boy living with his alcoholic mother. When she threatens him in a drunken rage, he accidentally pushes her down a ladder to her death. When taken to a rural orphanage, Ikar insists that he be called ‘Zucchini’ – his mother’s nickname for him. While living in the orphanage, Zucchini starts to befriend the disparate group of children already living there – as well as develops romantic feelings for the subsequent arrival Camille, a traumatised girl with a secret of her own. My Life as a Zucchini (released in some markets as My Life as a Courgette) is a remarkable film. Directed by Claude Barras, it was seen as so good in its native Switzerland that it was that country’s submission to the Academy Awards for Best Foreign Film. It didn’t get nominated, but it did get a nod for Best Animated Feature – and deservedly so. This is a thoughtful, considered and emotionally powerful children’s film; one of the best I have seen in some time. The film’s greatest asset is its melancholy. It is beautifully presented and boasts a wonderfully vivid use of colour, but it also captures a downbeat tone that is rarely seen in children’s film. Zucchini is orphaned because he accidentally kills his own mother. Another child is living in the orphanage because their refugee mother has been put in detention. Another’s sole parent is in prison, while yet another’s story hints at sexual abuse. With each character the film presses on remarkably adult material, but presents it in an easy-to-digest and understandable fashion. It is, in a sense, a film about finding love when there is no one left to love you back. That is pretty heavy stuff for kids, but Barras and his crew have absolutely succeeded in expressing it. The design work is exceptional. The film has its own distinctive and unusual aesthetic, one that both suits its tone and looks boldly original. There is a simplicity to the film, one almost certainly derived from a modest production budget, but it is a simplicity that absolutely works in its favour. Every shot feels like it matters. Every subtle expression or tic from each character is clear and effective. Some of the most powerful moments are in the details. An early scene sees Zucchini building a tower out of empty cans; it takes a moment to realise they are all beer cans drunk by his alcoholic mother. Later in an excellent scene at a local funfair, Zucchini is entranced by Camille’s abilities on a rifle-shooting carnival stall. She explains that her father taught her how to shoot a gun. The same father also shot her mother. This all sounds tremendously unpleasant and depressing. The truth is that while the characters all come from sad and tormented places, their experience together is a bright one. 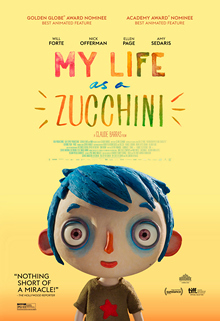 There is an incredible balance to My Life as a Zucchini. The darkness and the light complement one another, and indeed it’s the darker elements that make the small, intimate sparks of joy and humour flash all the more brightly. While the dialogue has been dubbed into English for the global market (and dubbed very well), the original score and diegetic music has been retained. It feels like a Francophone film even without the original voice work. It’s a brief work at just under 70 minutes, but Barras makes every minute count. It has a perfect length: just enough time to explore a group of wonderful characters, and to tell a gentle and insightful story with them. It starts from a heavy place, but My Life as a Zucchini finishes as a genuinely emotional and heart-warming work. It’s simply tremendous stuff.